That's a great T-shirt, fun selfie! What a nice selfie T-shirt ! 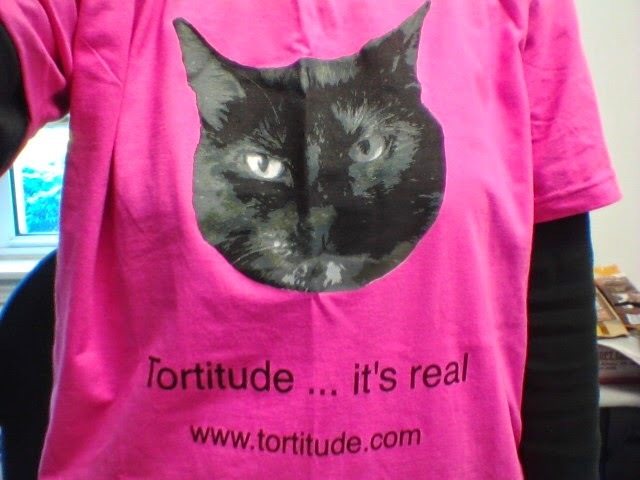 Love the shirt and of course, the tortitude! Hot pink! Love it! Gonna go check out that Torty website! That is a great shirt :) I love torties too, our tortie is Penny and she has the tude :) A.C. Moore had selfie sticks at the register for $14.99, but you could use a 50 % off coupon. That is just perfect for you! So adorable and anyone with a tortie will be enchanted! It's an awesome shirt, Melissa! I like the color of the shirt. My tortie Athena certainly has tortietude!